Have you ever been so discouraged that you just wanted to stay in bed and pull the covers up over your head? Maybe that’s where you are right now. I’ve hidden under the covers a time or two myself. OK, well maybe more than two. So how to we venture out? How do we get past what we can’t get over? A few years after the Israelites made it to the Promised Land, they grew tired of being ruled by God through the prophets. They wanted to have a king like all the other nations. The people picked a man named Saul because he was tall, dark, and handsome. I’m not kidding. It’s right there in black and white. Saul reluctantly accepted the kingship, was anointed by the Holy Spirit, and totally depended on God for his new position. But after a while, Saul decided being a king wasn’t so hard after all. He disobeyed and dishonored God by taking matters into his own hands. (Never a good idea, I might add). As a result, God snatched away Saul’s kingship and removed his anointing. Samuel was so discouraged over Saul’s failure; he went to bed and pulled the covers up over his head. He was disappointed in Saul, and felt sorry for himself. Now this is important. If I were sitting right there with you, I’d stand up in a chair and read this out loud. Here we go. One day God said, “How long will you mourn for Saul, since I have rejected him as king over Israel” (1 Sam. 16:1). Mope? Yep. That’s a good word. God asks you and me the same question: How long will you mope because life hasn’t turned out like you thought it would. How long? I don’t mean to make little of any of the painful or discouraging situations in your life. I’ve had them too. When my child died before she was born, I wasn’t sure I’d ever get out of bed again. Didn’t really want to. 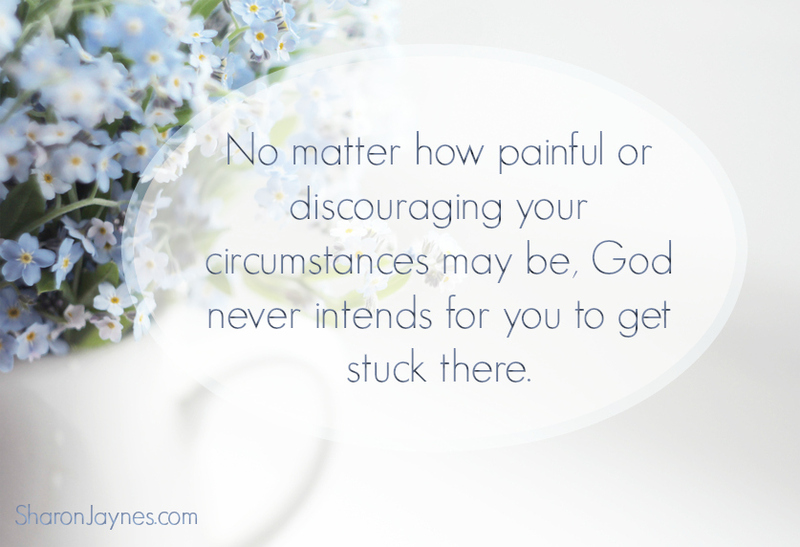 But here’s what I know today: No matter how painful or discouraging the circumstances of life may be, God never intends for you to get stuck there Click & Tweet! . (click to tweet) You should never put a period where God puts a comma. God goes on to say to Samuel: “Fill your horn with oil and be on your way; I am sending you to Jesse of Bethlehem. I have chosen one of his sons to be king” (1 Sam. 16:1, emphasis added). At some point in our moping about, God comes to us and says, “Enough already. Get up. Get going. Be on your way. I’ve got something for you to do. Your life is not over. The story has more chapters to be written. Let go of your discouragement and take hold of the next adventure I have planned for you.” Click & Tweet! The question is: What will you say? Samuel was terrified, but God assured him: I will show you what to do. You are to anoint for me the one I indicate” (1 Sam. 16:2–3, emphasis added). I will show you what to do. And that’s all God expects of me and of you—take the first step of obedience. Get up and get going. He will take care of the rest. I love the next sentence in the story: “Samuel did what God told him” (1 Sam. 16:4). Ah, the key to experiencing the adventurous life of a thriving faith . . . the faith you always longed for. Forward this blog to at least three friends, leave a comment to let me know you did it, and I’ll randomly draw one name for a FREE Identity in Christ laminated card. Today’s blog was taken from my new book, Take Hold of the Faith You Long For: Let Go, Move Forward, Live Bold. If you’re ready to take hold of all that Jesus has already taken hold of for you and placed in you, click here to learn more! Includes a Bible study guide for group or individual study. What a great read this morning. I fowarded it on to my friends. Thank you for giving of your time and talent to be a blessing. What a beautiful message Sharon, I’ve been here more times than I could count. I’m having a mopey time as we speak and it’s so hard to get out of it even when I know that I need to turn it over to God. I’m trying to get back to studying more and trusting more. I’ve gotten lazy in my quest for a better relationship with my God. I’m on disability, involved in Ministries in, church, a caregiver, and a mother of a son who has admitted to his stepmother that he’s gay. I’m not suppose to know the latter. He hasn’t told me and I’m trying not even think about it. I recently got out of a relationship of 20 some years, 8 1/2 years of living together. Love it!!! Sent post 2 a few friends just 2 encourage them to take their behind parts off Gods throne & allow Him 2 do His job because He who has began a good work in us will complete it until the day of Jesus Christ.. Our story is still being written so get rid of the period – so in agreement.. By the way my name is Eddie but I am truly female? I sent to some friends! Thank you for sharing really needed to hear this. I really enjoy your devos. I forwarded this to three of my friends. Thank you Sharon for being such a wonderful messenger! I forwarded this to 3 valued relationships. My husband died two years ago and I am stuck. I get it, it is just so not my nature to be down. I trust God with all of my heart he brought me through the storm of illness and saying good bye to to my best friend. I’m finding it so difficult to not feel sorry for myself. That at my age (53) I am starting all over again. My job is a negative place and I need to snap out of this and this posts confirms that for me. Handing my ego and over sensitivity over right now to God!!! Praying for the grace to listen and obediently follow God’s plan for me!!! I get it, I really do. I pray that when God shows you a step to take, that you’ll take it. There’s more to your story! Hand HIM the pen. Love you, sister. Annie, I am so sorry for your pain, but Our Father has you. He is embracing you and won’t live you. You are not alone. You are a daughter of the Most High. Sharon, thank you for this message today. Life has been very hard for awhile and literally today i wanted to stay in bed with the covers pulled up. It was so hard to crawl out of bed. I have been working in a very negative place with mean spirited administration. Have tried finding other jobs but nothing has come through. As a single mom, I can’t just up and quit so each day, I go. Dealing with a physical disability the past few years has been life changing and difficult. Some days by the time I get home, I can barely move. Add the financial needs to the picture and I am almost paralyzed. Today I face a broken down car and a dead pine tree that needs to be remove. Those two things are going to cost me 1550.00. I don’t even have 150.00 extra today. All this stress and worry makes it very easy for me to mope. Thank you for helping me get my eyes off me and my circumstances and back on the one who can and will provide, protect and take care of. I have repented of my moping and now getting up, dressed and busy getting my home cleaned. God is so awesome and I thank him for your annointment. This message today speaks not only to my situation, but to my soul. Praise God– stop moping and do what I need you to do NOW, not what I needed you to do THEN. Thanks for sharing this. Forwarded post. Shared today’s blog message with 3 friends. Thank you. This came at a good time for me. i forward these blogs everyday to more than ten people. Awesome encouragements daily. Thank you for the reminder to keep moving. Thank you for pointing out ‘moping’ in the bible. Exactly exactly what God needed me to share with someone I care about! HIS TIMING IS SO PERFECT! Just shared it with my friends…thanks for the inspiration Sharon. He is an on time God! Needed to hear this tonight. Been a rough one. Thank you! I sent this to more than three of my friends. My worst ‘what if” did happen. but it was the best thing that ever happened to me! I was always afraid of the “what if”. But, Jesus allowed it and He did walk with me, supported me, strengthened me, taught me, loved me and never left me! He taught me things during that time that I could never have learned any other way. Now I am free of all my “what if’s”, because I knew Jesus is with me and will never leave me. I have greater faith and trust in Him and definantly more love! Never be afraid, the Lord will be with you! Just trust Him & obey Him and He will see us through anything and make us better through it! I am mailing two copies to friends who do not have email and forwarding this to two of my sisters. I needed this today! Thank you for allowing God to use you to get His point across! Well done! I forwarded this to many friends! I know quite a few of them, including myself, needed to see this! Thank you!! I’m not sure I’m done moping yet, but that is wonderful encouragement for the future and moving on. Thank you. I’ve forwarded it to two of my friends who are hurting too. We have a sovereign Lord and He has known the end from the beginning. Sharon, this article has touched me in ways I cannot even explain. I just went through a long period of pulling the sheets over my head. I’m finally treading forward slowly. Trying to restore my faith and let go of fear. This article is going with me everywhere I go. Thank you for blessing me with this word from God. Praise God! Get up and get going. I know it’s hard. I’ve had God pop me on the bottom many times! Forwarding your post to several friends who could use your encouraging words. WOW!!! Inrefef to hear this do much right now. I have been stuck for so long…over a year. Thank you for this word of GOD and your insight.